Do not allow brake fluid to adhere to any painted surface such as the vehicle body. If brake fluid leaks onto any painted surface, immediately wash it off. 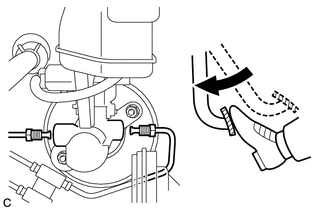 Before bleeding the brake system, confirm that the reservoir located above the master cylinder assembly is filled with brake fluid. If bleeding is performed with the engine running or the engine switch on (IG), DTC C1441 will be stored. Make sure to clear the DTCs when work is complete. If any component of the brake system is removed and reinstalled, or if air in the brake lines is suspected, bleed the brake system. To prevent brake fluid from damaging painted surfaces, cover any surrounding parts with a piece of cloth. Be sure to clean your hands before bleeding from master cylinder to avoid any potential contamination of the brake system. Contamination, for example by dirt particles or mineral oil, could lead to functional brake problem. If the master cylinder is reinstalled or runs out of brake fluid, bleed the master cylinder. 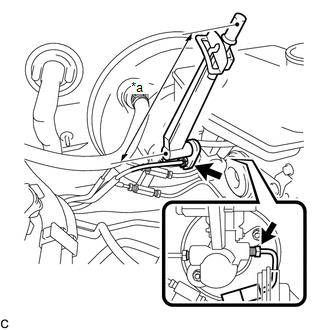 (a) Using a union nut wrench, disconnect the 2 brake tubes from the brake master cylinder assembly. (b) Slowly depress the brake pedal and hold it down. 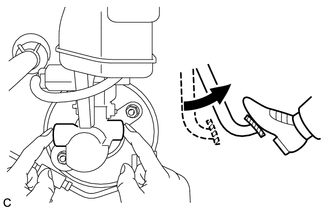 (c) Cover the 2 tube holes with your fingers and release the brake pedal. (d) Uncover the holes, slowly depress the brake pedal and hold it down. While holding down the brake pedal, cover the tube holes again. Repeat this step 3 or 4 times. (e) Using a union nut wrench, connect the 2 brake tubes to the brake master cylinder assembly. Do not bend or damage the brake lines. 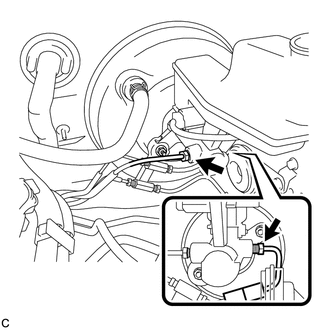 Do not allow brake line to twist and interfere with other parts or body during tightening. Do not allow any foreign matter such as dirt or dust to enter the brake line.